An impressive 10,000mAh Lithium–Polymer battery can easily power your smartphone and tablet simultaneously with built–in Lightning and microUSB cables. Simply connect your mobile USB to the Extreme Trio 10000 to top off up to 3 devices.Fast charge your tablet with the 2.4 Amp rapid charging port. Don't worry about leaving your tablet or smartphone ..
No need to carry any cables, T08 has combined the charging cables and USB recharging cableBuilt in Lightning cable: applied for most Apple devices ,like Iphone 6 6S Plus 5S 5 Ipad pro 3 2 air etc.Built in Micro USB cable: applied for most Android devices,like Samsung Huawei LG Nexus Motorola VIVO,tablets and more.Built in standard USB cable for rec..
Build-in charging cables with Type-C, Micro USB and LightningWireless ChargingAdditional Input lightning & USB-C portSupports both Apple and AndroidBuild-in recharging USB cable..
1.7 Nintendo Switch ChargesGet Up to 10 Additional Hours of PlaytimeCharge While You PlayPower Delivery for Full-Speed USB-C ChargingPowerIQ for Your Other DevicesRecharges in 3.5 HoursOptimized for Flawless Compatibility with Nintendo Switch..
-Power Bank With Power Delivery + Qualcomm 0.3 Technology -Input : Micro USB 5V 2.1A -Output: Type-C/PD + QC 3.0 Total Output : 5V 3A Total.. Solar power banks can charge without any electrical input. This means that they have no associated costs that they bring along.They can be used anywhere on earth, you just need to have access to sunlight. Solar power banks are very versatile and can charge any basic gadget. You will never have to worry about any electrical shortages as the sun.. This smartphone wireless charger that allows you enjoy the fun of digital product easily. With this stylish accessory, you can charge your compatible smartphones, without the need to plug your device in to a wall charger or USB port. 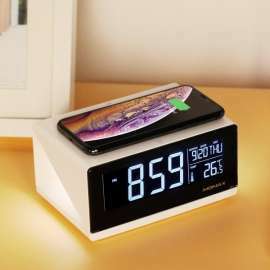 Just place down your phone or any Qi-enabled devices on Qi charger.Power Bank 5000mAhUser manual..
USB C Portable Charger RAVPower 26800mAh Battery Pack with Dual Input Port and Double-Speed Recharging, External Phone Charger 2 USB Ports for iPhone, iPad, Galaxy, Android and other Smart Devices.. Capable of charging a Nintendo Switch while it is being played. The Only USB PD Portable Charger Up To 45W: Recharge the 20100mAh battery through the Type-C port in just 4-5 hours (compared to the standard 10hours); also features 2Ainput recharging. Note: Type-C charger sold separately. Type-C port is incompatible with the Type-C cable or charger o..
10000mAh Capacity Built-in MFi Lightning Charging Cable Soft Touch by Smooth Rubber Finish iSmart Fast Charging Technology High-Temperature Protection Over-Charging Protection Short-Circuit Protection Voltage + Current Stabiliser..
Model Number : RP-PB101 External Product ID : RP-PB101-BK Brand : RAVPower Number of Charging Ports : 2 Compatible Devices : Multi External Product ID Type : None Capacity : 4001-5000mAh Type : Wired Power Bank Black..
IP67 Rating for WATERPROOF, DUSTPROOF, SHOCKPROOF: Custom made for a life of adventure with waterproof, dustproof and shockproof design; this power bank is your lifeline when things get rough. iSmart TECHNOLOGY: Exclusive iSmart technology detects and delivers the optimal charging current of your device. Featuring a powerful 18W PD Type-C..
IP67 Rating for WATERPROOF, DUSTPROOF, SHOCKPROOF: Custom made for a life of adventure with waterproof, dustproof and shockproof design; this power bank is your lifeline when things get rough. 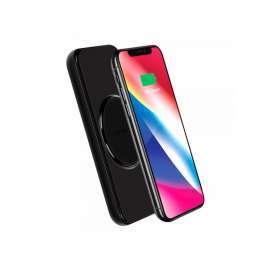 iSmart TECHNOLOGY: Exclusive iSmart technology detects and delivers the optimal charging current of your device Featuring a powerful 45W PD Type-C port and a.. Product DescriptionPowerCore II 20000The Ultra-High Capacity Portable Charger with Upgraded CompatibilityFrom ANKER, America's Leading USB Charging Brand- Faster and safer charging with our advanced technology- 20 million+ happy users and counting- Worry-free 18-month warrantyLightspeed ChargingAccess unrivaled charging speeds—for Apple, Quick Char.. The Compact High-Capacity Portable Charger with Upgraded CompatibilityPowerIQ 2.0: Our brand-new exclusive technology. Intelligently identifies your device to deliver the fastest possible chargeSleek and Compact: Designed with optimal portability in mind. Slips easily in and out of a purse, pocket, or bagRapid Recharge: Top up the battery in as lit.. 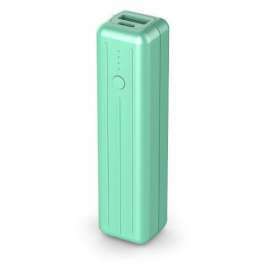 The iWalk SBS100C is a 10000 mAh mobile power supply powerbank. It is one of the premium mobile power supply available in the market as it comes with PD, QC, and FCP (three fast charge output capabilities) while it can be recharged by PD, and QC fast charging technology only. It comes with decent looks and usability in two colors Black and white.&n..
Lapu PD, a powerful powerbank, comes to you with a capacity of 7000 mAh. 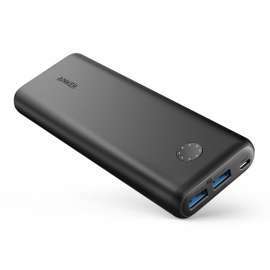 This not only gives you more than enough charger for your smart devices, but it's smooth and stylish finish gives it the fashionable look that all powerbanks should have Power Delivery technology and provides fast charging for any of your USB Type C-enabled device compatible d..
PowerCore+ 26800 PD with 30W Power Delivery Charger, Portable Charger Bundle for iPhone X / 8 and all mobiles and laptopsHigh-Speed Charging with USB-C Power DeliveryOver 7 Phone ChargesRecharges in 5.30 Hours..
Portable Design:Built-in cables(type-C cable, micro USB cable and connector), no need carrying any cables.Quick charge & recharge speed: Support QC 3.0 output and input, only takes 6 hours to fully charge itself (Use via a QC charger). Support charge 3 devices simultaneously and pass-through function.Strong and Powerful: Charge multip..
26800mAh External Battery with Dual Input Port and Double-Speed Recharging, 3 USB Ports for iPhone, iPad, Samsung Galaxy, Android and other Smart Devices.The Fast-Recharging Colossal-Capacity Portable ChargerFrom ANKER, America's Leading USB Charging Brand• Faster and safer charging with our advanced technology• 20 million+ happy users and counting..
-Lipstick Sized Design, Put in yur pocket,clutch bag or purse handbag ealiely as a mini emergency portable battery charger. 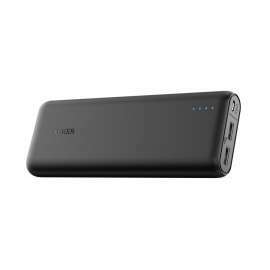 -3300mAh is big enough to add almost 1.2 charge (6 hours talk time) to an iPhone 7, or about 0.8 charge to a iPhone 7 plus. -Built in lightning cable connector, just plug & charge, never bother with lightning charging cabl..
Lipstick Sized Design, Put in yur pocket,clutch bag or purse handbag ealiely as a mini emergency portable battery charger.3300mAh is big enough to add almost 0.7 charge to an Galaxy S8 or LG G6, or around one charge to most other phones.Built in type C cable connector, just plug & charge, never bother with type C charging cable again.Power bank..
PowerCore 15600UPC848061064681From ANKER• Faster and safer charging with our advanced technology• 20 million+ happy users and countingSuper-High CapacityEnough power to keep you going for days. 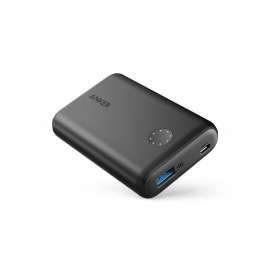 Charge an iPhone 6 over five times, a Galaxy S6 four times or an iPad Air more than once.Fast Charging TechnologyExclusive to Anker, PowerIQ and Voltag..
High Capacity power bank with 2 usbEnough power to keep you going for days. Charge an iPhone 6 almost four times, an iPhone 6 Plus or Galaxy S6 two and a half times or an iPad Air once.High-Speed Charging TechnologyMultiProtect Safety System : Exclusive to Anker, PowerIQ and VoltageBoost combine to ensure the fastest possible charge speed up to 3 a..
V-LineA set of Goui’s newest powerbanks.THE FASTEST CHARGING POWERBANKS FOR ALL DEVICES!These new chargers have something that no other charger has:Supports PD Technology + Qualcomm TechnologyVogue, a powerful powerbank, comes to you with a capacity of 10200 mAh.This not only gives you more than enough charger for your smart devices, but it’s smoot..
V-LineA set of Goui’s newest powerbanks.THE FASTEST CHARGING POWERBANKS FOR ALL DEVICES!These new chargers have something that no other charger has:Supports PD Technology + Qualcomm TechnologyVectra, a powerful powerbank, comes to you with a capacity of 7000 mAh.This not only gives you more than enough charger for your smart devices, but it’s smoot.. Slim and TrimTake over an entire phone’s worth of power, anywhere, with an incredibly slim design that weighs about the same as a baseball. Smart ChargingAccess the ideal charge, perfectly suited to your device’s unique needs. 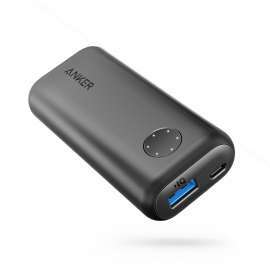 Anker’s PowerIQ technology automatically detects and adjusts output power to reduce charging times. Enhanced Aest.. The Compact High-Capacity Portable Charger with Upgraded CompatibilityPowerIQ 2.0: Our brand-new exclusive technology. Intelligently identifies your device to deliver the fastest possible charge.Sleek and Compact: Designed with optimal portability in mind. 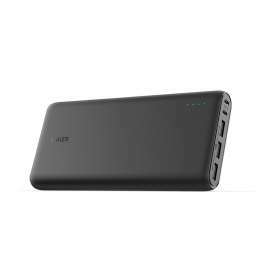 Slips easily in and out of a purse, pocket, or bag.Rapid Recharge: Top up the battery in as l..
Goui Kashi+ 17000 MAh Power Bank - Black : Fastest & Most Efficient Kashi+ USB Qualcomm 3.0, fastest and most efficient USB charging technology in the world to charge your devices up to 4X faster than standard chargers, 2 USB Smart Charge Ad Power Autodetection indentifies and adapt 2.4A.Also you can char..
Power Capacity: 10200mAh Super compact Robust design Touch-friendly two tone-finish Power battery and micro USB cable included For tablets, smartphones, and other devices.. Perfectly Portable Slim, ergonomic design and grippable texture to go wherever you need to go. Twin USB Output Pump a week’s worth of power into two devices simultaneously. Unrivaled Compatibility Advanced charging technology ensures the fastest possible charge for almost..